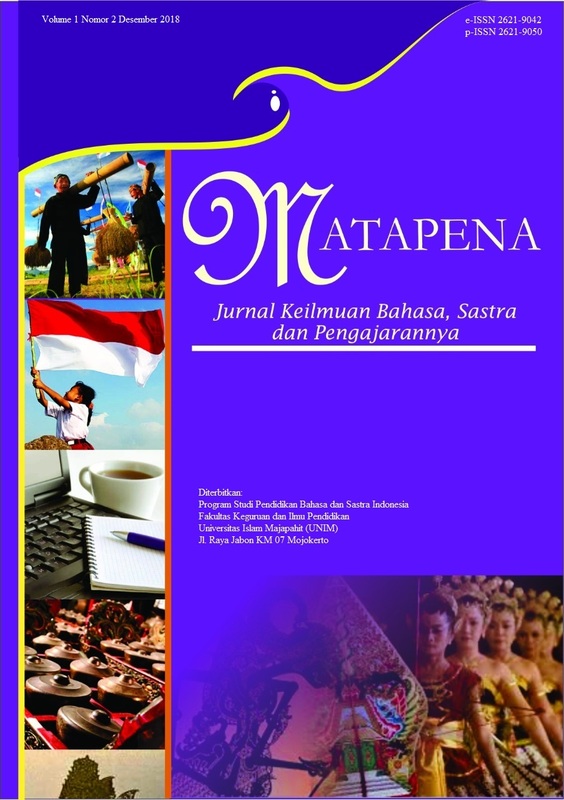 Matapena: Jurnal Keilmuan Bahasa, Sastra, dan Pengajarannya covers the fields of language, literature and teaching. Journal matapena published every June and December. The manuscript contained in the journal is derived from the results of research and critical studies of linguistics include: phonology; morphology; syntax, discourse, psycholinguistics; sociolinguistics; ethnolinguistics; semiotics; literature includes: the sociology of literature; literature psychology; education and learning. Matapena: Jurnal Keilmuan Bahasa, Sastra, dan Pengajarannya is published by the Indonesian language and literature education program Majapahit Islamic University. Published every June and December each year. Matapena: Jurnal Keilmuan Bahasa, Sastra, dan Pengajarannya of Sciences contains scientific studies of Indonesian teaching, language, and literature, Learning innovations, in the form of: 1) Research results, 2) conceptual ideas, 3) Library study, and practical experience . Online ISSN: 2621-9042. Print ISSN: 2621-9050. To access the articles contained in this journal, please klik ARCHIVES.